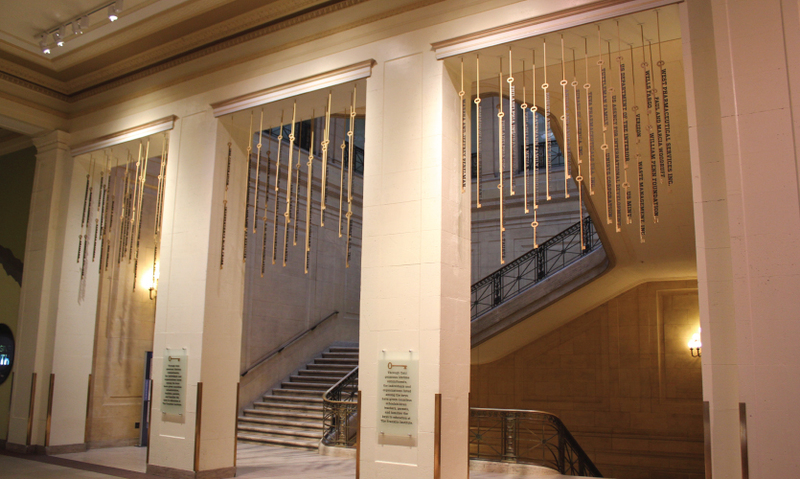 Major Gift donors to The Franklin Institute have been recognized with an individual key that now hangs in Key Hall overlooking the Benjamin Franklin National Memorial and the iconic Pendulum Stair. An alternate view of the installation. 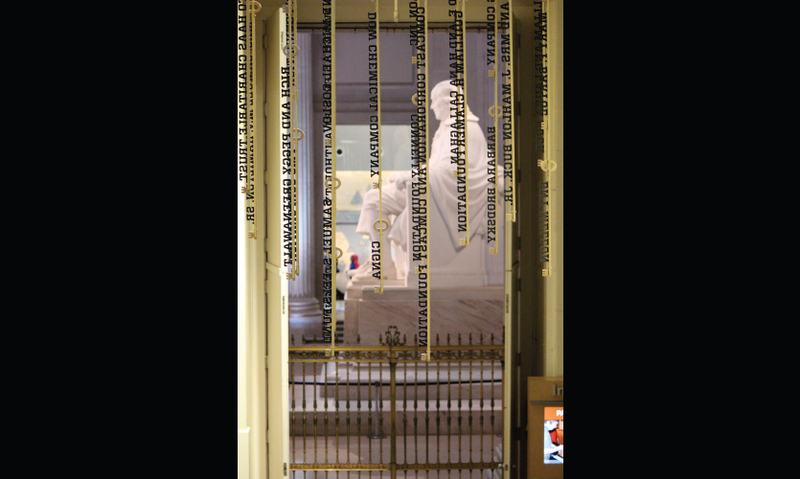 As visitors descend the Pendulum stairs, visitors can look through the key installation to the Franklin Memorial beyond. The staggered design onto a mounting plate allows for easy future additions to the installation. Two short introductory panels with dimensional letters on glass were installed beneath the keys. The Franklin Institute is a popular education and science center in Philadelphia. Together with the Benjamin Franklin National Memorial which is housed in the building's pantheon-inspired rotunda, it is one of the city's top tourist attractions. The Memorial is the fee-free entry area to the building and the section that sees the most visitors. So when Jeanne Maier, director of exhibits and design, and her team were charged with creating a highly visible major donor recognition system for the Institute, they chose a spacious hall immediately adjacent to, and visually connected to, this important space. Donor recognition installations were scattered around the building and failed to distinguish major donors; they were either wall-mounted signs that were easily ignored or freestanding billboards that interfered with important views to the statue of Franklin that is the center of the Memorial. "The older installations would be removed. The intent of this new installation was to bring real presence to donors whose cumulative gifts to the Institution totaled a half million dollars or more over a lifetime of giving," says Maier. "We sought to boldly recognize these gifts and also connect intrinsically to Franklin's unique history." As part of the overall project, annual donors were removed from the billboard signage and those names were made part of the Memorial's digital projection display. During the team's research phase they explored numerous thematic designs with connections to Franklin's life as a statesman, an inventor and a scientist, ultimately focusing on the literal elements of Franklin's famous electrical experiment of 1752: the kite, lightning and the key. "We were drawn to the key," says Maier, "because of the additional message it conveys that the donor's contribution is the key to helping the Institute offer exciting programming and evolving exhibits." The formal hall selected for display of a key-themed design boasts twenty foot ceilings with ornamental plaster molding and looks out on a travertine staircase appointed with decorative brass and ironwork. "We knew we wanted to take our display away from the walls," Maier says. "and we were intrigued by the three open thresholds leading from the hall onto the staircase. The idea of something sculptural, almost chandelier-like, suspended from each of the ceilings of the wide thresholds was how we found our design direction. All of our design options involved using the thresholds and the height of the space." From the hall, visitors would be able to read donor names on the keys and, when descending the staircase, they would see through the keys into the majestic Benjamin Franklin National Memorial. With no major exhibition in the works at the time, the team was excited to be able to create design options for this installation in-house. Maier, with many years'; experience as a graphic designer before being promoted to lead the exhibition and design department, drew out alternative designs herself. 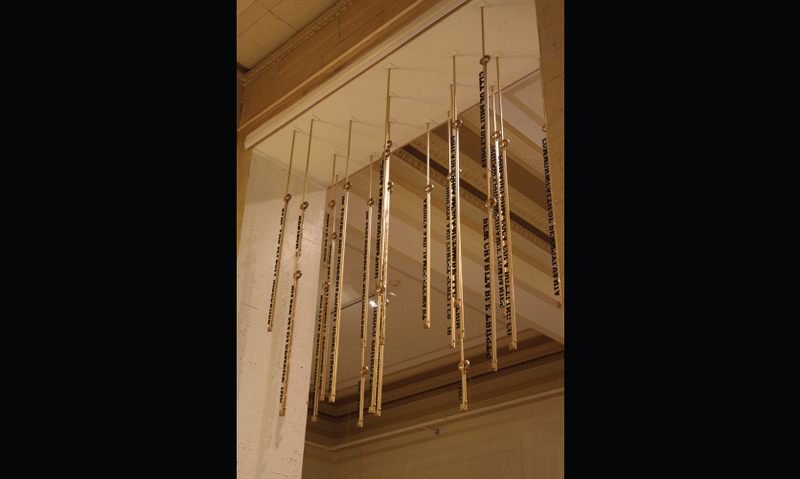 "The final option chosen, was for long keys to suspend on rods from the ceiling of the opening with each name standing on the stem of a key," Maier says. "Our thoughtful planning during design development allowed us to cost-effectively fabricate multiples of the circular heads and skeleton-key feet that would attach securely to custom-length stems of each key. The dimensional letters for donor names were cut as one unit with a solid bar beneath to ensure stability of the letters as they were fitted into the slot in each key's stem." The donor name dictated the precise length of each key. This variety of lengths added to the artistic form of the installation. 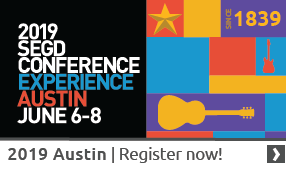 Maier, together with Lauren Smedley, graphic designer, and Stephanie Pryor, graphic design manager developed the design options for review and final approval by in-house development department staff including Marci Generose and Julie March. AGS developed the shop drawings and created a full size prototype which was mounted in the space to test colors and get a sense of the perspective. "We were very careful to match our metal colors to the banister on the staircase and to the brass and iron of the gates between the hall and the Memorial. We wanted the new keys to fit seamlessly into the ornate original architecture." Considerable time was devoted to understanding how the keys would be installed. 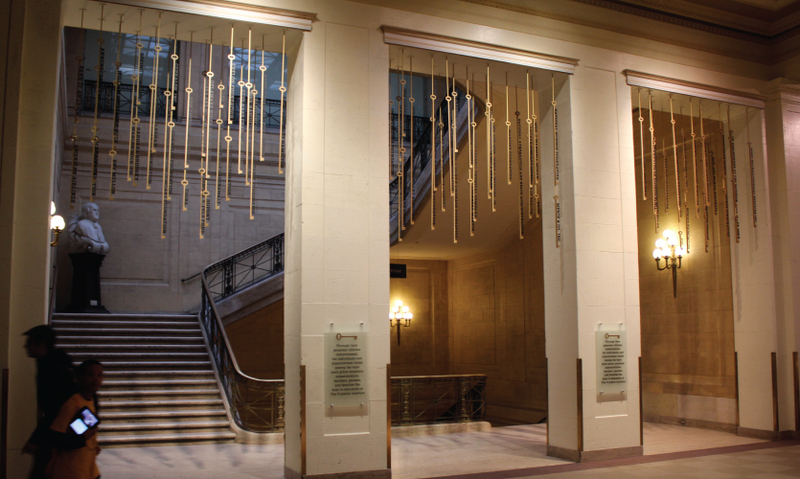 A mounting plate was developed to attach side-to-side into the faux travertine columns at the sides of the openings; ornamental molding at each threshold was built by an in-house cabinetmaker,to hide the plate and match the hall's ornamental ceiling. When this method was tested, it was discovered that the building drawings were not accurate as to the construction of the columns. The mounting plate and support rods were lengthened to pass through the surface of each column and through a hidden three-inch gap to reach the structural beam inside the column. The keys were hung off the mounting plate with pleasing visual arrangement taking precedence over strict alphabetical order. To help orient the visitor to the installation, two short introductory panels with dimensional letters on glass were mounted on the wall beneath the keys. "This major donor recognition system was a team effort, with people from many areas of the Institute involved at some level, and we view it as a success." Maier says. "The installation enhances the visitor's experience of the space and brings into focus the meaning of such generous gifts." It also had the unexpected benefit of showing donors a fresh appreciation for a contribution they may have made long ago. 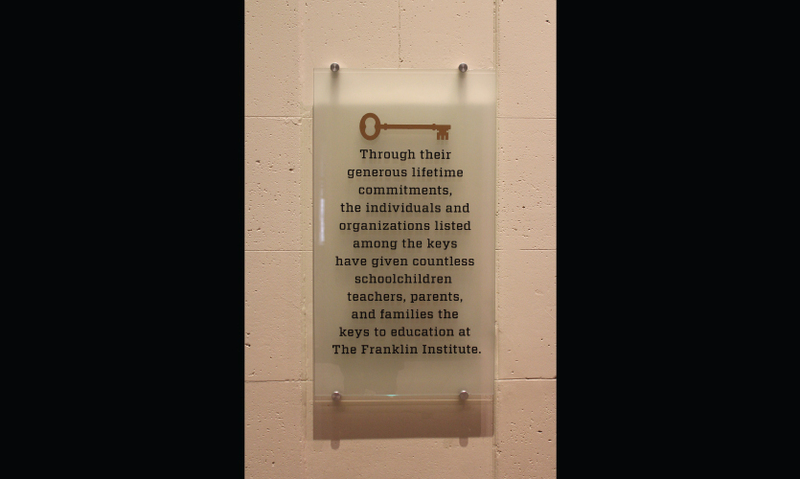 When The Franklin Institute hosted a party in the grand hall to celebrate the installation of the keys, donors were surprised and pleased to be so recognized. And, each donor was given a small key as a remembrance and thank you. The design team had two concerns that were soundly dismissed at the party. "At first we worried that reading the backs of keys from the staircase would be distracting," Maier says. "But, it's interesting that the foreground disappears and instead your focus is drawn to the Memorial. Also, since everyone was recognized with the same type size, each donor's key size was determined by the length of their name and not the size of their donation. One of the shortest keys carries the name of one of the biggest donors. No one seemed to mind. They only appreciated the design for its profound meaning and artistry."